Much has been said over the centuries of a "third" place that people go to after death. In the Second Book of Maccabees 12:43-46, it says, "He then took up a collection among all his soldiers, amounting to two thousand silver drachmas, which he sent to Jerusalem to provide for an expiatory sacrifice. In doing this he acted in a very excellent and noble way, inasmuch as he had the resurrection of the dead in view; for if he were not expecting the fallen to rise again, it would have been useless and foolish to pray for them in death. But if he did this with a view to the splendid reward that awaits those who had gone to rest in godliness, it was a holy and pious thought. Thus he made atonement for the dead that they might be freed from this sin.". Have Gregorian Masses said for your deceased loved ones. Since Martin Luther threw both books of Maccabees out of his Protestant Bible during the sixteenth century Reformation, most Protestants today don’t recognize Maccabees as scripture. However, both 1 and 2 Maccabees are in the Gutenberg Bible, published a century before Luther was born, which proves that the Catholic Church didn't add them at the Council of Trent after the Reformation; they were taken out by Luther during the Reformation. "David said to Nathan, "I have sinned against the LORD." And Nathan said to David, "The LORD also has put away your sin; you shall not die. Nevertheless, because by this deed you have utterly scorned the LORD, the child that is born to you shall die." Here we see God punishing David by taking the life of his son, even after God forgave David for killing Bathsheeba's husband, Uriah the Hittite, by putting him on the battlefront (So David could take Bathsheeba for his wife). This verse also tells us that our children can suffer mightily, even death, because of our own sins. "will not be forgiven in this age or the age to come" (Matthew 12:32). “And in anger his lord delivered him to the jailers, till he should pay all his debt. So will my heavenly Father do to you, unless each of you forgives his brother from his heart" (Matthew 18:34-35). “But you have come to Mount Zion and to the city of the living God, the heavenly Jerusalem, and to innumerable angels in festal gathering, and to the assembly of the first-born who are enrolled in heaven, and to a judge who is God of all, and to the spirits of just men made perfect, and to Jesus, the mediator of a new covenant, and to the sprinkled blood that speaks more graciously than the blood of Abel. " May the Lord grant mercy to the household of Onesiphorus, for he often refreshed me; he was not ashamed of my chains, but when he arrived in Rome he searched for me eagerly and found me; may the Lord grant him to find mercy from the Lord on that Day -- and you well know all the service he rendered at Ephesus. "nothing unclean shall enter heaven; "
so it can be assumed that if we are still unclean when we die, thanks to God's amazing grace, we shall still be able to enter heaven thanks to the cleansing fires of purgatory.
" The work of each will come to light, for the Day will disclose it. It will be revealed with fire, and the fire (itself) will test the quality of each one's work. If the work stands that someone built upon the foundation, that person will receive a wage. But if someone's work is burned up, that one will suffer loss; the person will be saved, but only as through fire. " Hebrews 12:29: "For our God is a consuming fire." 1 Peter 1:7: "The genuineness of your faith, more precious than gold that is perishable even though tested by fire, may prove to be for praise, glory, and honor at the revelation of Jesus Christ." "went to speak to the spirits in prison"
There are some who think that it is sacrilegious to pray for the dead, in spite of what the second Book of Maccabees says.. Well, think about this…There is no time in Heaven. God exists only in eternity, and knows the future. God, in his infinite wisdom, thus knows when a person dies that a loved one will be saying prayers for him/her years down the road. He then applies those yet-to-come prayers to the dead person's sentence in purgatory at the time of death. Of course the worst thing in Purgatory, besides the cleansing fire, is the knowledge that you are separated from God, because of your sins on earth. That intense longing to see God is both painful and comforting at the same time, because you know that you have made it, but must still wait to be cleansed. To sum up, the Church, under the direction of the Holy Spirit has always taught that Purgatory does exist. It is not a second chance to be saved, but rather, a place of cleansing for the already saved before entering into heaven. People who die with unexpiated sins or the attachment to sin on their souls go there, and are cleansed in the purifying fire of Purgatory for a period of time. Once they are purified, they go to heaven and enjoy the Beatific Vision forever. These people remember who prayed for them while they were in Purgatory, and then start offering prayers to Jesus for them. St. Therese, the Little Flower, and the 33rd Doctor of the Church, tells us that it offends God greatly when people say that they will surely have to spend time in purgatory after death. She says that Jesus would rather not send anybody there, and he would prefer that one has TOTAL TRUST in HIM now so that they won't have to spend one second in purgatory later. It seems that believing in one's own sinfulness rather than in the infinite mercy of God to forgive them becomes a self-fulfilling prophecy to spend time in the fires of purgatory instead of going straight to heaven. The believer through discipline divests himself of his passions and passes to the mansion which is better than the former one, passes to the greatest torment, taking with him the characteristic of repentance for the faults he may have committed after baptism. He is tortured then still more, not yet attaining what he sees others have acquired. The greatest torments are assigned to the believer, for God's righteousness is good, and His goodness righteous, and though these punishments cease in the course of the expiation and purification of each one, "yet" etc. (Patres Groeci. IX, col. 332 [A.D. 150-215]). If a man departs this life with lighter faults, he is condemned to fire which burns away the lighter materials, and prepares the soul for the kingdom of God, where nothing defiled may enter. For if on the foundation of Christ you have built not only gold and silver and precious stones (I Cor., 3); but also wood and hay and stubble, what do you expect when the soul shall be separated from the body? Would you enter into heaven with your wood and hay and stubble and thus defile the kingdom of God; or on account of these hindrances would you remain without and receive no reward for your gold and silver and precious stones? Neither is this just. It remains then that you be committed to the fire which will burn the light materials; for our God to those who can comprehend heavenly things is called a cleansing fire. But this fire consumes not the creature, but what the creature has himself built, wood, and hay and stubble. It is manifest that the fire destroys the wood of our transgressions and then returns to us the reward of our great works. (Patres Groeci. XIII, col. 445, 448 [A.D. 185-232]). The citizen of a prominent city, I erected this while I lived, that I might have a resting place for my body. Abercius is my name, a disciple of the chaste shepherd who feeds his sheep on the mountains and in the fields, who has great eyes surveying everywhere, who taught me the faithful writings of life. Standing by, I, Abercius, ordered this to be inscribed; truly I was in my seventy-second year. May everyone who is in accord with this and who understands it pray for Abercius (Epitaph of Abercius [A.D. 190]). That allegory of the Lord [Matt. 5:25-26] . . . is extremely clear and simple in its meaning . . . [beware lest as] a transgressor of your agreement, before God the judge . . . and lest this judge deliver you over to the angel who is to execute the sentence, and he commit you to the prison of hell, out of which there will be no dismissal until the smallest even of your delinquencies be paid off in the period before the resurrection. What can be a more fitting sense than this? What a truer interpretation? (The Soul 35 [A.D. 210]). The faithful widow prays for the soul of her husband, and begs for him in the interim repose, and participation in the first resurrection, and offers prayers on the anniversary of his death (Monogamy 10 [A.D. 213]). Then we make mention also of those who have already fallen asleep: first, the patriarchs, prophets, apostles, and martyrs, that through their prayers and supplications God would receive our petition, next, we make mention also of the holy fathers and bishops who have already fallen asleep, and, to put it simply, of all among us who have already fallen asleep. For we believe that it will be of very great benefit to the souls of those for whom the petition is carried up, while this holy and most solemn sacrifice is laid out (Catechetical Lectures 23:5:9 [A.D. 350]). Let us help and commemorate them. If Job's sons were purified by their father's sacrifice [Job l:5), why would we doubt that our offerings for the dead bring them some consolation? Let us not hesitate to help those who have died and to offer our prayers for them (Homilies on First Corinthians 41:5 (A.D. 392)). Not in vain was it decreed by the apostles that in the awesome mysteries remembrance should be made of the departed. They knew that here there was much gain for them, much benefit. When the entire people stands with hands uplifted, a priestly assembly, and that awesome sacrificial victim is laid out, how, when we are calling upon God, should we not succeed in their defense? But this is done for those who have departed in the faith, while even the catechumens are not reckoned .is worthy of this consolation, but are deprived of every means of assistance except one. And what is that? We may give alms to the poor on their behalf (Homilies on Philippians 3:9-10 [A.D. 402]). Give perfect rest to thy servant Theodosius, that rest which thou hast prepared for thy saints… I have loved him, and therefore will I follow him into the land of the living; nor will I leave him until by tears and prayers I shall lead him wither his merits summon him, unto the holy mountain of the Lord (Funeral Sermon of Theodosius 36-37 [A.D. 395]). That there should be some fire even after this life is not incredible, and it can be inquired into and either be discovered or left hidden whether some of the faithful may be saved, some more slowly and some more quickly in the greater or lesser degree in which they loved the good things that perish, through a certain purgatorial fire (Handbook on Faith, Hope, and Charity l8:69 [A.D. 421]). "Jesus and Mary, I love you, save souls." St. Catherine of Genoa experienced the pain and suffering of Purgatory, and actually wrote about it. To read her treatise, click here. Another booklet worth reading about Purgatory is READ ME OR RUE IT . The last recommended reading is HOW TO AVOID PURGATORY. 1. Your spiritual life is enriched, your progress in perfection hastened. You gradually realize the wisdom of avoiding sin, which makes it necessary for some souls to accept a lonely exile from the heavenly abode of their desire. 2. You grow in faith, hope, and love. You strengthen your faith in the great supernatural realities which God has revealed. You buoy up your hope in His magnificent promises of resurrection and everlasting happiness. By loving those the Lord loves, you increase in those virtues which are so excellent. 3. Your appreciation of time increases. You no longer kill time, but prize its preciousness more. Time is like a currency with which to purchase eternal joy. The time God places at our disposal to know, love, and serve Him passes all too swiftly. Don't we all complain that the years get shorter as we grow older? 5. You gain helpers in death. You have earned the holy souls' everlasting gratitude, and they will never forget you. As you pleaded for them, so will they for you, especially when the hour comes to close your eyes to the things of earth. In that hour, can anyone have too many intercessors? All these are weighty reasons for remembering the holy souls in your Masses, Communions, Rosaries, Stations of the Cross, and other prayers and charitable works. 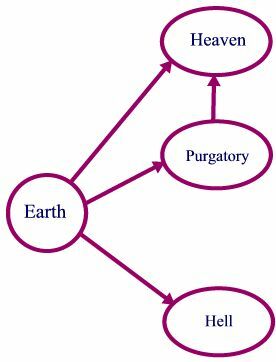 Here is a pictorial image that shows the relationship of Purgatory in the grand scheme of things. It is only a stopover on the way to heaven, to cleanse the soul from the effects of sin already forgiven (1 Corinthians 3:15). It is NOT a second chance at salvation. The poor souls in purgatory are already saved. More from David MacDonald at Catholic Bridge .